Well, it wasn't a jungle, but it was to JoJo. Steph asked, "Did you have fun?" She said, "Yes, I went to the jungle and we sang songs." I had a pretty funny and humbling moment after giving out the Bibles. JoJo who had been playing happily in the car, came over and said, “I have to go PooPoo.” Now, remember, I just finished passing out the Bibles at this historic moment in the life of the church. I said to Jojo, “You have to go or you did go...” I smelled and realized that my newly potty trained daughter had, well, you know, done the deed and now I had to clean it up, in the car, with flies and a church, sort of watching. And it got everywhere, and it was pretty nasty. But, it was perfect, too. I mean they were all shouting and clapping as they talked about receiving Bibles, and I was cleaning up my daughter in the rural “jungle” in the middle of nowhere Africa. It is life. And, it just fit, I guess. Life is messy that way. The pastors were so excited afterwards. It was so great watching them minister. Joseph, on the way home even said, “I even preached the way you taught (in the preaching class. )” Of course, I didn’t know because I couldn’t understand him. He also said, “I didn’t want to really come. I needed to work and I have malaria, but I just didn’t have peace. I knew I needed to come.” I am glad I came as well. It’s not often you get the chance to give away Bibles to a new church in the middle of nowhere. 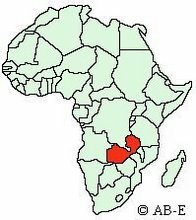 Pray for this young church in rural Africa that the church may grow strong and that Peter Zulu will be able to continue shepherding this young church from his home in Lusaka. In this picture I was speaking through Peter as a translator, speaking to the church about how cool this Proclaimer would be for their church. I was sharing about the importance of the Bible and how it is like food and water to our soul. JoJo entertaining herself in the car with her new friend. The elder reading out of his newly acquired Bible. This is probably my favorite picture. I just love JoJo looking intently at the church with her friend by her side and her hands wrapped around her arm. Praying for the different members to receive Christ and for healing prayers. Reading his new Chewa Bible. Church under the tree... Love it! Singing in Zambia at its best... A picture does quite capture the joy that video does! Thank you for your Great Commission work and partnering with us in using the Proclaimer. God bless!